Patent number US20150246720 was published yesterday, from Toyota Motor Engineering & Manufacturing North America. It’s a design for a wing system for a potential flying car. And not just any wing system — it’s a stacking one that looks like an 1898 flying machine contraption. Go home, Toyota, you’re drunk. Yes, it seems the engineering staff of Toyota has been murdered by time-traveling, be-goggled Victorian eccentric tinkerers, and now they’re applying for patents. Because it’s not enough to just believe in the not-gonna-happen inanity of the flying car, but to really sell it, we need flying cars with stacks and stacks of stubby wings, rising ladder-like from our car roofs. The system described in the patent has some novel ideas, and also some vast unanswered questions. The wings themselves use an interesting little rotating cam-like thing to deform and reform the bottom of the wing, changing the wing’s profile to go from flight-ready to a collapsed, stackable shape. It’s not just one wing shown here, though. On the roof of the car, the patent drawings show a quadruple-wing setup that can be deployed in varying amounts to, I suppose, increase or decrease the amount of lift generated. More wings=more lift. 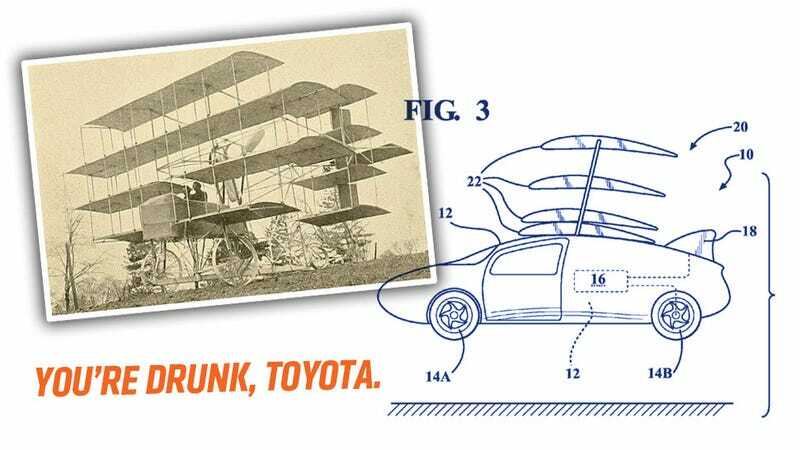 The patent is deliberately vague about propulsion or other details, which makes sense, since the patent is focused on the wing design, though you’d think it wouldn’t have killed them to show, you know, the front or back of the car. We only get a 2D side view here — how wide are these wings? Are they just the width of the roof? are there any side wings or a tail provided for at all? Wouldn’t you need something wider than a few feet to make this work? Maybe I’m being a close-minded jackass, but it looks like Toyota has a severe leak of goofy gas in their engineering department. I’m all for it. I’m hoping in the next few weeks Toyota will release drawings of their next-gen Prius with its standard diamond-tipped boring device (making the car a boring device in two distinct ways!) that allows it to penetrate the hollow crust of the earth and drive on the vast inner-earth network of roads, courtesy of his Majesty, The Great And Terrible Mole King. All hail the Mole King.